We love Science. We love Our Doctors. We love our chemistry and we love our modern medicine. Science is almost a like infallible God to us. It is true that modern medicine and science has extended life expediency. But before you respond “yes we are living longer”, I would like to ask are we any healthier? We are at a point in history where people are living longer than ever. But we also have more chronic, neurodegenerative disease, are diabetic, over weight, have less energy, in more pain than ever before. We have an epidemic of people addicted to pain pills. We seem more depressed sleep deprived and unhappy. We may live longer but sicker. What Happened Since our Grandparents Time? Let’s Say around the 1930’s? But it wasn’t always that way. Our ancestors as recent as our Grandparents seemed healthier. They didn’t have our modern day long list of illnesses. They may have known about cancer but it was extremely rare. Heart attacks were unknown. They could work all day out in the fields only to take a meal break. They would sit down and eat a healthy homemade dinner and go back work some more. Our ancestors ate plant based food and were kept healthy from the healing power from these plant-based foods. We eat plastic synthetic food and are heavily addicted to plastic synthetic man made medicines. What Happened to cause a change? Two major World Wars, World War I, World War II, the Arms Race and the Cold War. Governments looking to outsmart and control the enemy turned toward science. The wars became wars of who had the better scientist. A new scientific revolution developed. The World of Science matured into what we now call modern science. New fields were created such as biology, chemistry, genetics, medicine and physics to name a few including what we now call biotech. The War Years became a battle of technology and research to who could build the biggest and best. Science became not only part of nation-state functioning but part of every day life covering every conceivable aspect of living. Science became the new God all-powerful and perfect. The research lab turned from finding the perfect bomb to the finding the perfect Wonder Drug. Science research is very expensive especially if you have been given the powers of a God, with the unlimited magic power of Chemistry. Technology could outsmart Nature any day. So where could you go to replace this unlimited Government funding? In case you can’t guess I’ll give you a clue John Q. Public – You create a unique product John Q. Public can’t life without. The best part is the product is unique you invented it!! It can be patented giving you total control of every aspect especially the profits. A complete monopoly — Unlimited Funds – What could be better? Major Industries formed and the corporate world was born. It started with medicines which became our modern pharmaceuticals then moved on to fertilizers and the control of growing food, then control of ever aspect of every conceivable product known to man. They even came up with a way to control the actual seed (Monsanto’s GMO’s) control the profits from every seed that is grown. Did you know the first Wonder Drug Came from a Tree? It can be debated as to what was the first Wonder Drug? Many would respond penicillin but in fact the first wonder drug was what Bayer’s called Aspirin. In the late 18’s Germany’s pharmaceutical industry was thriving the country was a leading exporter of the opiates morphine and cocaine – drugs were available on every street corner. The German located Bayer Company first product was Heroin, introduce in 1898 and marketed as a cough suppressant and pain reliever as an alternative to morphine. Aspirin was introduced to replace Heroin and its side effect of addiction. It should also be noted that both Heroin and Morphine are plant-based. As readers of this blog know, I was very sick and nursed myself to wellness by what I ate. This blog is the story of how I got well using plant-based foods. I for the last 6 months have been focusing on slowly detoxing my body using the same method. Concentrating and learning from Mother Nature’s world of herbs, seeds, and roots. I have found many beneficial extremely helpful herbs. In cause the FDA gets excited I’m not saying anything one thing heals. The only thing that heals is your body and it does that naturally. Plants know more about survival than we do. Plants existed on this Planet way before any form of life. Plants originated in the oceans, as the oceans receded the plant was exposed to the toxic environment. The plants soon learned how to survive the harsh atmosphere. Plants created what is called Photosynthesis. Photosynthesis is the building block of life. The oxygen produced contributed directly to the oxygenation of the Earth, which made the evolution of complex life possible. 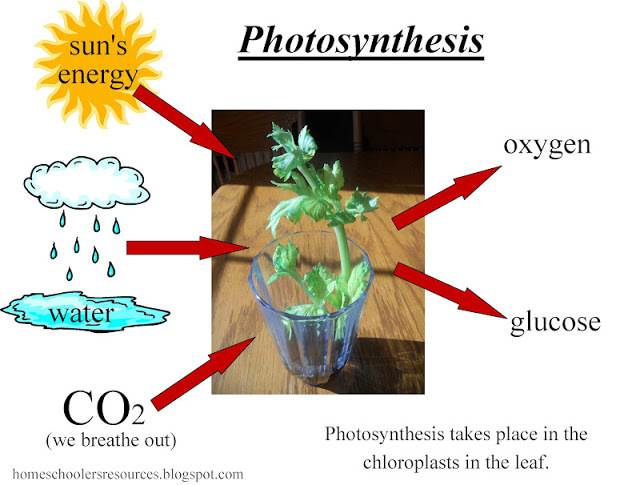 Photosynthesis enables plants and algae to make their own food, but also provides animals and humans with food and oxygen. Centuries of civilization of mankind learned to adapt and use the plants around them for nourishment and for healing when they got sick. Generations of civilizations passed by word and mouth the discovered healing methods. Modern medicine is was created by the military-industrial-political complex created during the World Wars and the Cold War. It is now driven by the love of profit and control of what is now a multi-national power structure. This structure is in control of what we purchase, what we eat, and how we live. 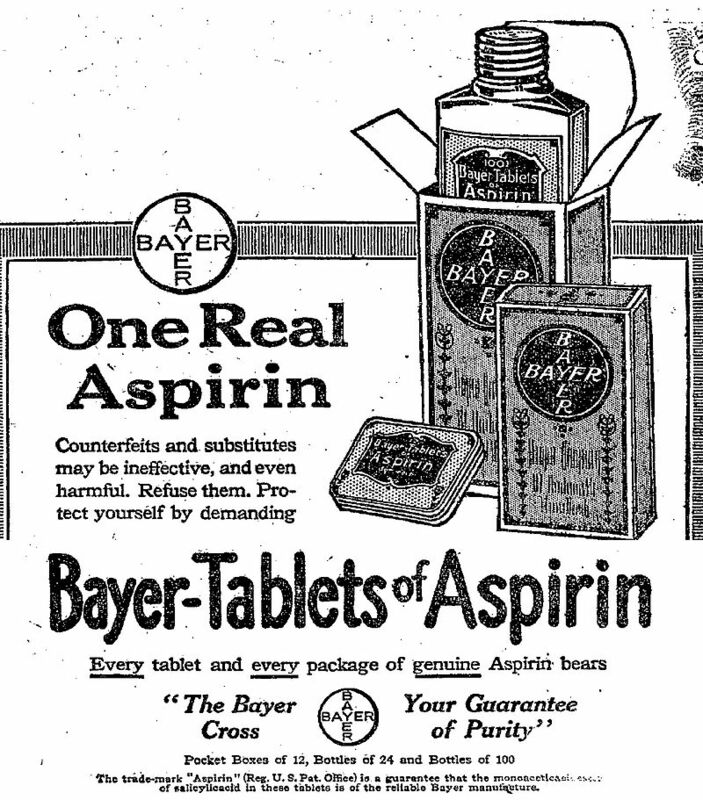 The best way to tell the story of how the modern pharmaceutical came into being is the history of the company called Bayer and the product called Aspirin. Bayer AG A German multinational chemical and pharmaceutical company founded in Barmen (part of Wuppertal) Germany in 1863 by Friedrich Bayer and his partner, Johann Friedrich Weskott. Bayer became a major part of Germany’s mobilization for superior scientific and technological resources like chemistry and rocket science which lead the world. Germany hoped for quest was to become the Worlds Superpower. In 1889, Bayer’s first product was trademarked “heroin” (diacetylmorphine), which is now illegal as an addictive drug. Bayer originally marketed it as a cough suppressant and non-addictive substitute for morphine. Bayer also had the first hypnotic drug in 1903 it licensed the patent for phenobarbital (diethylbarbituic), used as a sleep aid and anti-epileptic. The first Sulfonamide drug prontosil which became the first widely used antibiotic it was replaced by the more profitable penicillin (first patented by Merck & Co.) and other antibacterial that proved more effective against more types of bacteria. Bayer had been spending years analyzing the Willow tree bark to be used as a replacement for the addictive products of heroin and morphine. They hoped to isolate the “active ingredient” in willow bark. 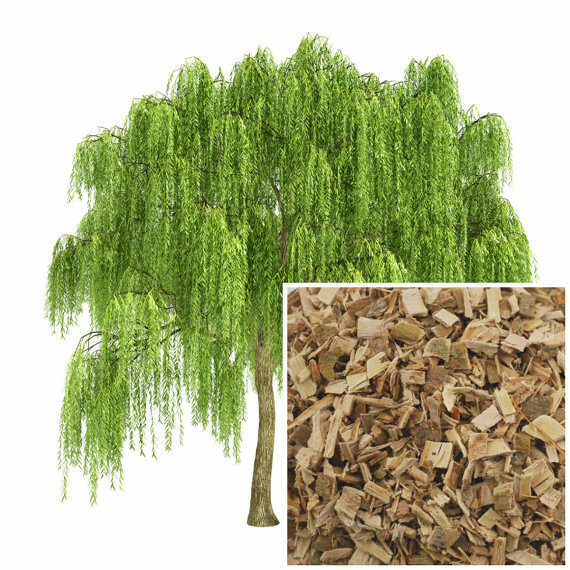 Salicylic acid or Acetylsalicylic Acid is abundant in the bark of the willow tree and had been found to help with pain and a fever reducer. Finally in 1897 Bayer isolated the main “active ingredient” salicylic acid and putting it into pill form. 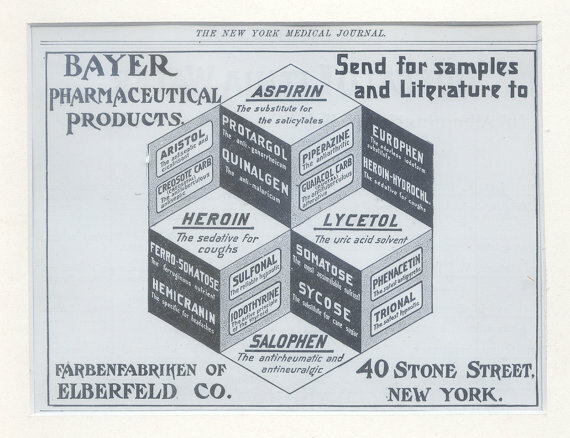 By 1899 Bayer was selling it around the world. Its popularity grew during the Spanish flu pandemic of 1918. The product was soon being referred to as A Wonder Drug. Did you know there are 27 other foods that contain Natural Aspirin? Products synthesized from natural products typical cause side-effects that the natural food or herb usually doesn’t cause. The whole plant or whole plant extract, is a complex system with many interacting chemicals which influence the effects on the consumer. The isolation and extraction of one active ingredient from a plant are less effective than when they are consumed in the whole plant. The list of side-effects of non-steroidal anti-inflammatory drugs (NSAIDs) is lengthy. It ranges from addiction, GI irritation and/or death to list a few. There is more to the healing than just the one active ingredient. The modern world of chemical medicines are barely 100 years old, yet the human race has existed for tens of thousand of years and have survived some very harsh physical conditions including Global Warming, Freezing and whatever else Mother Nature has thrown at Humanity. Our modern medical world doesn’t have time to understand the body and its illnesses. Its easier to write a prescription then to spend hours and days getting to the real source of the problem like chronic fatigue, or lack of energy. Our current modern medicine is designed to block the enzymes that create the symptoms. In other words your body is trying to tell something is wrong you go to the doctor he writes a prescription for medication like a beta blocker or antihistamine or antibiotic which is blocks the enzyme sending the message. Modern science seems to have lost the ability to observe. It seems to have forgotten the real world of reality. The concept of proof has been replaced by the control trials, blind studies and placebos . Modern science seems to be more concerned with idolatry (worship of idols) and false absolutes. How much do we really know about them? Nature has provided an abundance of everything we need to feed ourselves. Yet, we have decided we are too sophisticated to eat foods of the earth and turn our backs on nature. Maybe the time has come when we should look back to nature for our food. Good reminders. 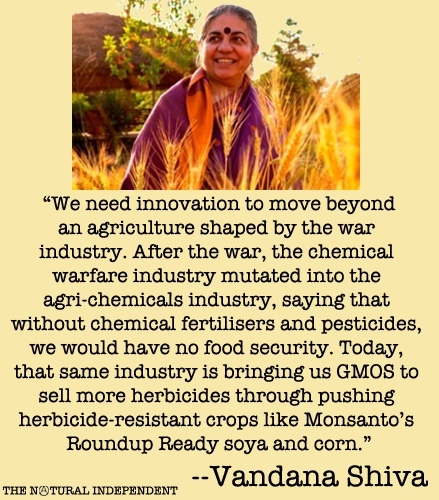 That the path to a healthy, regenerative food and farming system requires working with, not against, nature. Even though that path is paved with battles against corporate greed and political corruption. We no longer talk of Wonder Drug the major concern today is the Superbugs that no antibiotic can touch. Our wide-spread abuse of antibiotics have created the emergence of so-called “superbugs” that are capable of outsmart even the most potent antibiotics which are to blame for the annual death of over 700,000 people according to an article from natural news. “superfoods” defined by WebMD as “multitasking food substances that provide multiple disease-fighting nutrients”. Maybe we should start looking for superfoods instead of looking for more Wonder Drugs. Aspirin The Remarkable Story of a Wonder Drug by Diarmuid Jeffreys 2004.